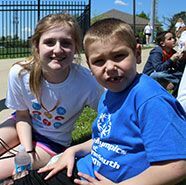 Twice a year, Lutheran South students serve those in need by hosting Special Olympics events for children in St. Louis area special schools. In between events, the athletes enjoy lunch and the activities of Lutheran South's own "Olympic Village" with carnival games, facepainting booths, a visit with local firemen in their fire truck, crafts and fun! At the end of the day, Lutheran South students and their special athletes are all smiles, each learning from each other, and sharing in God's blessings of friendship and caring. Special Olympics is just one way Lutheran South students, faculty and staff share the love of Christ and his example of serving others. "I wanted to tell you how impressed our school was at the Track and Field Special Olympics you hosted. Our buddies were fantastic with our students, they stayed engaged even though many of the students who attended from our school are non-verbal. One buddy noticed that one of my students was not interested in the events of track and field, found a soccer ball and kept that student engaged and active the entire event. I also wanted to compliment you on the booths that were at the event, they were so centered around the needs of our students! The sensory area, bubble area, puppet making, cake walk and so on, kept my students engaged and interested. Please inform your students from the staff at Crestwood how much we thoroughly enjoyed our time at Lutheran South and the time our students were able to spend with them." "Even though (LHSS student) Suzy had a challenging buddy today, but she was incredible! I was so impressed with her maturity, excitement and overall character. She was truly a spectacular buddy!" "It's nice that we get to learn how the kids are, and how to interact with them and how to have fun with them. I really enjoy it. You learn a lot from it. You get to be involved, and it makes you feel like you're making a difference in your community."